Two of Minneapolis' most heralded DIY punk bands stopped at Kum-N-Go last month for sets that radiated a timeless attitude. Kitten Forever has been active in churning out feminist-minded punk rock for the better part of the last decade. The trio switched between vocal, bass, and drum duties throughout their half-hour set as they built inventive grooves and shout-alongs and tackled an array of societal ills. 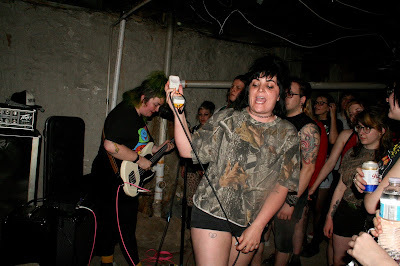 Kitten Forever was joined by Royal Brat for a brief leg of their month-long American tour. Royal Brat's set was as snotty as it was sleek and melodic. The band's nineties college rock sensibilities of "Gut" evoked plenty of hip-shaking and could easily land the band on Don Giovanni if they so pleased. Vocalist Alex Uhrich's sneering cheerleader melodies on "Snowball" in tandem with their band's precision playing was a gut-punch that Kansas City didn't know it needed. By the time the show was wrapping up, just about everyone in the basement was drunk or dehydrated, so a mellow full-band performance Dead Dads Club was a keen way to close out the night. The show was opened with a clunky set from Kansas City punks Dog Gamm!t.